Visiting Toa Baja and meeting representatives from six member federations in San Juan, Coe said he was humbled by the destruction that so many people lived through and heartened by the generosity of spirit shown by the communities in the area. Representing the Virgin Islands at that forum was President of the BVI Athletics Association (BVIAA) Mr Steve Augustine. “There is still so much that needs to be done to rebuild the lives of those affected by these hurricanes but it is heartening and humbling to see what has been accomplished by communities, their governments and by collaboration of neighbouring countries and islands,” Coe stated. Athletics federations across the region have lost communications, offices, training facilities and equipment. Tragically, Hurricane Irma took the life of famed coach Xavier “Dag” Samuels as it passed through the [British] Virgin Islands. Samuels coached [British] Virgin Islands’ Kyron A. McMaster, the 2017 400m hurdles world leader and IAAF Diamond League champion. “The athletics fraternity came together and we have seen many athletes continue their training on other islands as welcomed guests of these countries,” said Coe. “For example, both Turks & Caicos and Anguilla sent athletes for training to Jamaica, Dominica’s athletes were welcomed to train in Guadeloupe, British Virgin Islands’ athletes went for training to the USA and to Jamaica. Also Puerto Rico and the Virgin Islands had to relocate a lot of their athletes to the USA”. 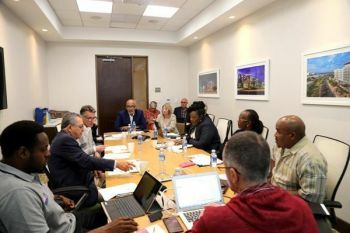 To assist in this the IAAF announced a US$500,000 solidarity fund to help member federations in the North American, Central American and Caribbean (NACAC) area recover from the devastating damage caused last year by the four hurricanes. Hurricane Irma destroyed the recently resurfaced synthetic track at A.O. Shirley Ground, as well as the pavilion, gym, washroom facilities, administration area, and floodlights. “I would like to put on record my sincere thanks to NACAC Area President, Victor Lopez and his team for their unflinching and tireless work over the last five months keeping the member federations and me informed of what was happening and conducting a thorough audit of the damage that has occurred across the sport in the region,” Mr Coe said, according to an article by the IAAF on January 15, 2018. The fund is made up of contributions from the IAAF, the International Athletics Foundation (IAF) and Seiko. “We are extremely grateful for the contribution of our partner SEIKO whose response to this disaster clearly reflects a world leading company whose heart is deeply embedded in the fortunes of the global athletics family. We thank them for their support,” said Coe. The allocation of funds will be handled by a dedicated team, headed by the IAAF, and based on the audit of damage and needs of those federations affected, stated the IAAF article. “Our mission should not be just to create the champions on the track. We believe that is equally important to enable local communities to help embed our timeless athletic values in the lives of young people,” concluded Coe.